Pizza. 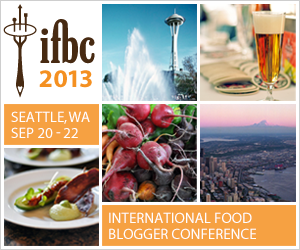 The Perfect Food Made Better: Bacon & Roasted Poblano Chili Pizza! As Wife will attest, I never met a pizza that I didn’t like. Traditional Italian pizza — real pizza — is the best, and home-made, take-out or even frozen pizza is awesome. One can make the case that it is the perfect food. Easy to make, you eat it with your hands, and depending on the toppings, it has all the good stuff you need in a meal: carbohydrates, dairy, fruits or vegetables and protein. Hot from the oven or cold from the ‘fridge, pizza tastes great — it’s genius! But bacon and pizza? That’s genius on steroids! This pizza is better than perfect! Bacon & Roasted Poblano Chili Pizza! A delicious artisan style pizza! Open pizza dough package and let the dough rest for twenty minutes. While dough is resting, prepare bacon using your favorite method. Pat dry using a paper towel and chop into ¾ inch pieces. 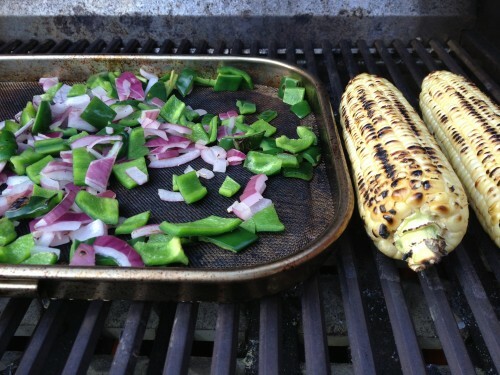 On hot grill, or under broiler, char corn, poblano chili peppers and onion. Remove corn from cob, and set aside along with peppers, onion and chopped bacon. Free form pizza dough, making a thin crust by following package directions. Bake dough for 5 minutes at 450 degrees on a cookie sheet lined with foil. 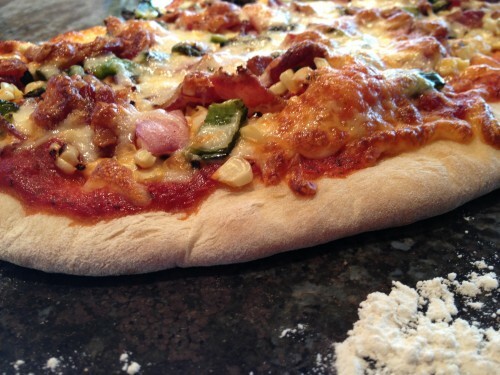 Remove dough from oven, and spread the sauce on the pizza in a thin layer leaving about 1 inch border at the edge. Add ½ of the cheese. Brush exposed edge of pizza dough with olive oil. 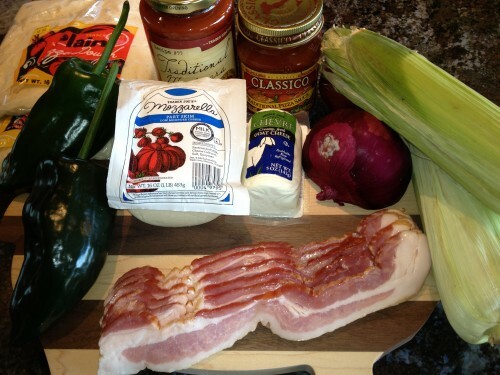 Now add the bacon, corn, onions, and poblano chili peppers, and top with the remaining cheese. Bake in the oven directly on the rack according to dough package directions or until the cheese is nice and bubbly. Estimate about 10 -12 minutes. Shhhh! 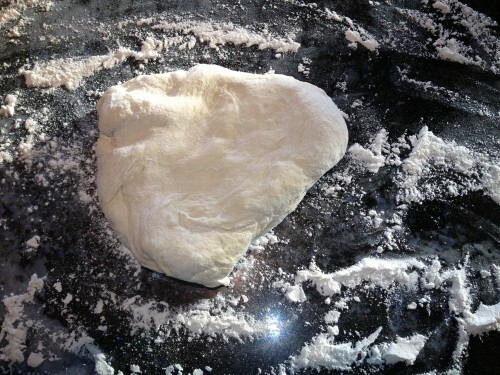 Pizza dough taking a flour nap…. The bacon baked in the oven at 400 degrees for 20 minutes. While the dough was resting and the bacon was baking, I grilled the veggies on the BBQ grill. 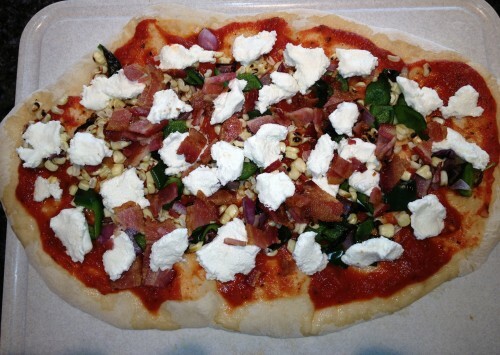 The ingredients added and the pizzas assembled, the goat cheese pizza is anticipating it’s next move…which is into the oven. 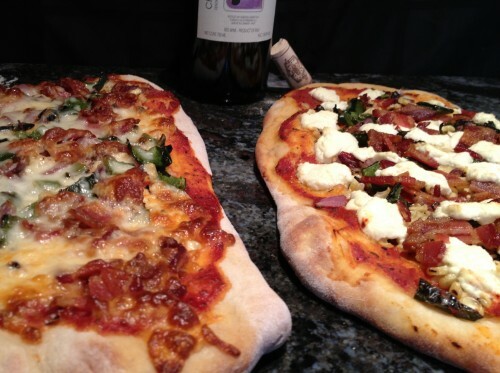 Both artisan pizzas baked, looking delicious, and it’s time to eat! Goat cheese on the right, mozzarella on the left. If you have more time and wish to make your own dough from scratch, go for it, but the store-bought products are pretty good these days. Regardless, the free form artisan style pizza make you feel like you’ve classed up a very common meal, and adding goat cheese certainly doesn’t hurt. Seriously? Who am I kidding…it’s the bacon! Goat cheese is impossible to shred unless it’s frozen — and that’s an option — but I just pulled apart the room temp cheese and left it chunky. As such, it dominated the flavors on the pizza, but interestingly, it accentuated the roasted corn. On the mozzarella version, the bacon was by far the dominate flavor. The poblano chilli pepper adds a mild bite, and complements the other veggies nicely. Roasting the vegetables is the way to go. Both pizzas were really excellent.